You know the old adage, "You make plans, God laughs."? Well some deity seems to be having a field day with me lately! See the thing is, I get so excited about certain things, and I run with them. Travel is a big one. I had it all figured out... until I realized that I didn't have our yoga teacher training spring break on the calendar... which meant I had the last three weekend trainings wrong by a week. Which meant rescheduling two trips. I won't say I'm happy with it, but what a lesson the past few weeks have been for me. Reminders to let go, that most things are not instantaneous, life or death decisions, and that I could really stand to take some time. Once I got over the initial surprise and disappointment (mostly in myself! ), I was able to sit down, figure things out, and adjust my expectations. I think things are going to work out just fine. 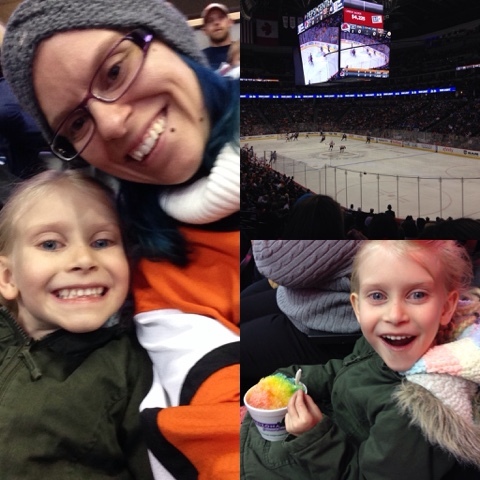 On the plus side, that spring break meant that Gwen and I got to go partake in the Flyers-Avs game! Not a bad "consolation prize!"